We’re not always business here at Advanced Septic Services – we also like a good list of fun facts! 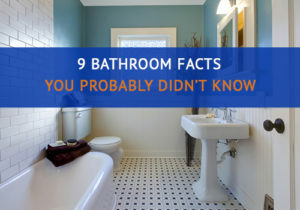 So, we compiled a list of fun, exciting bathroom facts that you might not already know that will be perfect for that one random trivia question. Warning: If you’re doing our #7, you might want to skip to #8 quickly! 1. Several cultures have toilet deities. In Japan, the toilet god Kawaya Kami protected communities in two respects – ensure overall sanitation of the sewer systems and protect people from falling into/drowning in the toilets. FYI, these toilets were much different from the ones that we have in our bathrooms. The Ancient Roman culture had a toilet god and a sewer goddess. The toilet god Crepitus was called upon when an individual was experiencing bouts of diarrhea or constipation. Crepitus was also known as the god of flatulence. The goddess Cloacina was known for protecting Rome’s sewer system, Cloaca Maxima. In fact, one Roman emperor, Titus Tatius, was said to have built a shrine to this goddess in his bathroom. 2. On average, a toilet will last 50 years before needing to be replaced. I bet you never thought that one of the oldest members of your household is your porcelain throne! 3. You have a 1 in 6,550 chance of being injured by your toilet. Did you know that in 1943, a malfunctioning toilet caused the U-1206 (a German submarine) to sink (indirectly)? Seawater rushed into the submarine through the broken toilet, which flooded the battery, creating chlorine gas. The boat had to surface and was sunk by Allied Forces once at the top. 4. Air fresheners have been around for quite some time. Islamic cultures in the 6th century used perfumes and incense to cover unpleasant stenches. The Egyptians were also known for using oils to give a pleasant aroma to their houses and temples. In 1948, the air freshener that we know today was first introduced and quickly became a household product. And thank goodness for that! 5. November 19th is World Toilet Day. World Toilet Day (WTD) was created to garner attention to and combat the crisis in global sanitation. Over half of the world’s population live without a properly working sanitation system. In 2001, WTD was created by the World Toilet Organization, which is a global non-profit focused on advancing sanitation conditions all over the world. How should you celebrate World Toilet Day? By decorating your toilet, outhouse, privy, latrine, water closet…whatever you call it! Just because it’s not a tradition now doesn’t mean it can’t be in the future. The French word toilette referred to “a cloth; a bag for clothes.” In the 18th century, the word changed to refer to an association with the wealthy population – it referred to articles used in dressing, like mirrors, brushes, perfume, etc. Other later variations of the word referred to dressing rooms, particularly quarters that had a ‘lavatory” attached to them. It wasn’t until 1895 that Americans began using the word toilet as we understand it now! 7. 3 out of 4 Americans admit to using their phones while using the toilet. When nature calls you gotta go! It doesn’t matter if you’re in the middle of an interesting septic blog. So, what are these people doing on their phones? Writing emails, online shopping, searching through social media? Each person’s habits are different. At Advanced Septic, we want to make sure you’re using your bathroom time efficiently, so we’ve already compiled a list of things you can do on the toilet. You’re welcome. 8. 7 million people drop their phones in the toilet every year. This is not on our list of things to do on the toilet. Careful, Butterfingers! 9. People spend an average of 3 hours and 9 minutes on the toilet per week. That’s almost one week per year! If you’d like to test our knowledge on septic systems and have questions about your own, give us a call at Advanced Septic Services today. For now, we hope you enjoyed these bathroom facts.